DRAGON QUEST V: Hand of the Heavenly Bride – the second installment in the Zenithia Trilogy – makes its way to North America for the first time. Follow a journey that crosses three generations of a family’s legacy in a classic RPG brimming with new ideas, numerous lands to explore, multiple branches to enhance replayability, and dozens of your favorite GRAGON QUEST monsters. With over 1.1 million units shipped as of September 30 in Japan, this pivotal title that introduced a monster recruitment system to the series and presented players with an ultimate choice that changes the course of the game comes exclusively to Nintendo DS(tm). Embark on a journey that spans three generations in this classic RPG experience crafted by creator Yuji Horii, manga artitst Akira Toriyama, and composer Koichi Sugiyama. Beloved by role-playing game fans around the world, Dragon Quest V: Hand of the Heavenly Bride is the second installment in the Dragon Quest, Zenithia Trilogy and has finally made its way to North America. Follow a journey that crosses three generations of a family’s legacy in a classic Nintendo DS RPG brimming with new ideas, numerous lands to explore, multiple branches to enhance replayability, and dozens of your favorite Dragon Quest monsters. 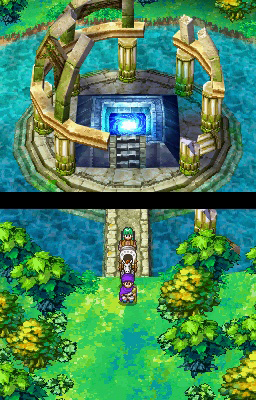 In Dragon Quest V: Hand of the Heavenly Bride, what begins as an innocent childhood voyage of a boy accompanying his father on a journey soon develops into an eye-opening adventure of a brave young man traveling the world as he faces life-altering decisions that transcend generations. You – a hero in the making – determine your own path, choose your wife, and befriend a wagonload of quirky monsters along the way. Indulge in the colorful Dragon Quest world created by Yuji Horii, combined with the charming characters and monsters designed by Akira Toriyama and memorable soundtrack from famed composer Koichi Sugiyama to create an unforgettable gaming experience. Although players will make the acquaintance of many characters and monsters throughout during their travels, here are just a few of the faces they can hope to see. As a child you discover a world filled with bizarre creatures and fantastical realms while traveling with your father. The owner of a truly pure heart, you have an unusual affinity with monsters. Pankraz is your father, with whom you travel with as a boy. He has a hardened look and a talent for magic. What is the purpose of his quest? There is more to Pankraz than meets the eye. You meet young Bianca in the town of Roundbeck while traveling with your father. Bianca is one of your oldest friends and has an animated personality overflowing with curiosity. Saved from the hands of the town bullies as a cub by you (The Hero), this great sabrecub travels and fights by your side during his youth and will mature along with you. 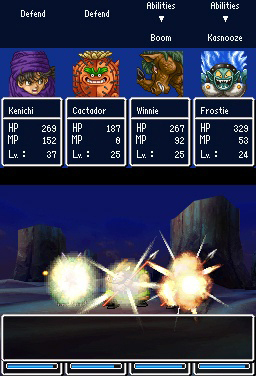 Although Hand of the Heavenly Bride is based in standard turn-based RPG gameplay mechanics like character leveling through with increased experience points and armor and weapon equipping for use in combat, it does add something new to the Dragon Quest series, monster taming. 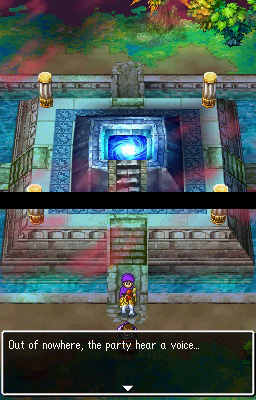 Throughout your quests you will encounter monsters both known and new to the Dragon Quest universe. Once tamed, these can join your party, level up just like your other party members and provide valuable aid in combat. Journey through a beautifully rendered 3D world, with dynamic dual-screen presentation and newly animated monsters. Recruit a unique cast of Dragon Quest monsters and create an indestructible party of your own. Brace yourself for some life-altering decision making – a key decision will affect the outcome of the game, and change the course of the hero’s life forever. Take a breather from the main quest with addicting mini-games like Bruise the Ooze, T ‘n’ T, the Slurpodrome, and the Tombola. 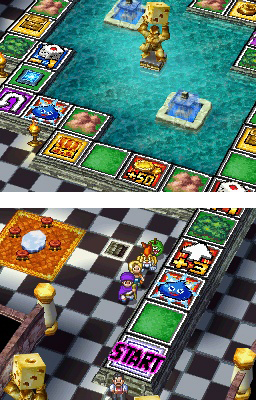 Collect and customize knick-knacks from around the Dragon Quest world to create a personalized knick-knackatory. Use the wireless capabilities of Nintendo DS to exchange in-game creations and one-of-a-kind collection of rare items with friends. Next-generation portable game console by Nintendo Pop-out 3D visuals without the need for special glasses Capable of taking 3D photos as well as normal photos using either the two outer cameras or the single inner camera StreetPass and SpotPass for communicating with people on the go or through the Internet Includes: 3DS XL console, AC Adapter, Stylus, 4GB SD card, 6 AR cards & Documentations. Be a Pokémon and experience the world in a whole different way. Enter into a spectacular adventure to save the Pokémon world. Uncover new adventures in the immersive Pokémon Mystery Dungeon storyline by playing new Special Episodes. Play as one of 19 different Pokémon (including five additional starter Pokémon). Find out which one you will become. Interact with more than 490 Pokémon as you explore. Trade items with your friends via a local wireless connection. Also, you can trade with Pokémon Mystery Dungeon: Explorers of Time and Pokémon Mystery Dungeon: Explorers of Darkness and see what happens. With a wireless broadband Internet connection, access Special Missions or rescue fallen friends over Nintendo Wi-Fi Connection. Pokewalker, a special pedometer is included. Use the Poke Radar to catch wild Pokemon! Find items by using the Pokewalker Dowsing Machine. Connect your Pokewalker with a friends and receive a special gift. Enhanced graphics and sound Pokewalker, a special pedometer is included. Use the Poke Radar to catch wild Pokemon! New Nintendo 2DS XL 4 Items Bundle: New Nintendo 2DS XL – Black + Turquoise Console, USB Sync Charge USB Cable, Mytrix Travel USB Wall Charger and Micro SD Card 64GB Colorful accents add style, while the sleek clamshell design makes it comfortable to hold and helps to keep screens safe from scratches when closed. A fast processor offers short loading times, so you can start playing in a snap. And it’s all in a lightweight, play-anywhere package. The C Stick brings enhanced controls (like intuitive camera control) to compatible games, while ZL and ZR buttons give you plenty of options You can play all Nintendo 3DS, New Nintendo 3DS and most Nintendo DS games in 2D on this system. Includes AC adapter.